Digital Subscriptions > Learn Hot English > 184 > TWO REALLY CREEPY PLACES! You’re going to read about two creepy places. One is an island full of dolls hanging from trees; the other is a dense forest in Japan. Why do you think they’re spooky? What are the dolls doing on the island? What do you think happens in the forest?Make notes. Read or listen to the article once to compare your ideas from the Pre-reading activity. Then, complete the sentences with words from the text. 1. Photographer Cindy Vasko described the island as the ______ place she'd ever visited. 2. A local legend says that a young girl ______ near the island. Good news! The latest issue of Hot English (184 – the September issue) is out now! Learn over 300 useful words and expressions and improve your listening skills with Learn Hot English! 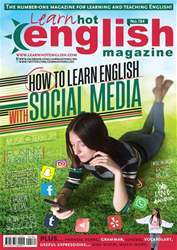 This month: How social media can help you learn English! Find out how to use social media to improve your reading, listening and writing skills. Plus, 12 useful words for talking about clothes and accessories, 10 useful words for talking about careers, work and jobs, 12 useful words to use when you go to a concert, 10 horror words, “fashion” idioms, “style” phrasal verbs... plus: • Fashion – how to be stylish. • Literature – banned books. • Geography – number-one countries. • Business – giving a presentation. • Relationships – dealing with bullies. • Work – the interview presentation. • Home – creating space. • Language – language mistakes. • Celebrities – Disney stars. • Books – Agatha Christie. • Food – stuffed peppers. • TV – 13 Reasons Why • Horror – creepy places. • True crime – In Cold Blood. • Music – pop music. • Politics – Boris Johnson. AND LOTS, LOTS MORE! By reading and listening to all this great content, you'll improve your English reading and listening skills and learn up to 300 useful words or expressions. Plus, you'll get a better job and pass English-language exams more easily. Guaranteed! WHAT’S YOUR COUNTRY NUMBER-ONE FOR? CLASSIC BOOKS THAT HAVE BEEN BANNED! How to describe sales figures! Listening activity!How to do a job interview presentation! How to deal with bullies! How to present information graphically! HOW TO SAVE SPACE AT HOME! FROM DISNEY STARS TO SUCCESSFUL ADULTS! How to contrast and compare data! WHAT DO YOU LIKE OR DISLIKE ABOUT CARS? BORIS JOHNSON – CLASS CLOWN! How to give an update in a presentation!